There are many birthday party options at Jam Hops. Main Gym Birthday Party - these are our traditional parties where the children have 90 minutes of gym time in our spacious gymnastics gym doing a variety of games, activities and open gym time and 30 minutes for food and presents. The main gym will have Ninja Zone obstacles set up that each party will have the option to explore. Let us know if your child wants a specific "Ninja" party. Nerf Kidz games and activities are also an option to add to a portion of your party. If your party consists of mainly children that are 6 and younger you also have the option to have time in the preschool gymnastics gym. NEW!! Cheer birthday parties are also an option now! They are available on a limited basis. This page has all the information for our main gym birthday parties. Dance Birthday Party - these are our parties where the children have 60 minutes of dance studio time (Glow in the Dark, Costumes, learn a dance), 30 minutes of main gym time, and 30 minutes for food and presents. We pride ourselves on having a party that is fun for boys and girls of all ages and easy for busy parents! trampolines for bouncing, flipping and having seat wars with their friends. a tumble trak for running and jumping into our big foam pit. a rope swing, rings and many sets of bars to show off their monkey skills. a big open floor for playing organized games and free play. balance beams to walk on and jump into a foam pit. a Nerf football on hand for football fans to play with. Our amazing gymnastics coaches are in charge of the party and will make sure the kids have fun and are playing safe! You as parents may be as involved in the party as you would like - come out in the gym with the kids to take pictures or relax while you watch from the side. Be sure to bring your cameras as there will be many photo opportunities you won't want to miss! *Note - Anyone over 18 is not allowed on the gymnastics equipment. Thank you in advance for complying with this rule. Our parties are a great value! $235 (tax included) for up to 15 children; including the birthday child. $300 (tax included) for 16-28 children; including the birthday child; although we recommend not having more than 23 children. Paper products and serving utensils; We provide all the plates, cups, silverware, napkins, etc. You may provide the food and drink or you have the option to purchase pizza, cake, juice and/or pop through us for a reasonable cost (see the information below). We have a refrigerator/freezer for your use. Birthday invitations; See the link below for the invitation we provide. All birthday guests must have an online waiver completed by a parent/guardian in order to participate at the party. Jam Hops t-shirt and birthday crown for the birthday child. A Jam Hops cup and 1/2 price open gym pass for each birthday guest. You are welcome to bring an additional party favor or goody bag to give the kids. Pizza: Chanticlear; choices are cheese, pepperoni or sausage; 10 slices per each 1 topping pizza. You also have the option to order Chanti Sticks. Cost: $10 per pizza or Chanti Sticks (includes delivery and tip!). Minimum order of at least 2 pizzas. We recommend ordering one pizza for every 5 people if you want everyone to get 2 slices, and that seems to be a good amount. The Chanti Sticks are cut into about 20 strips and include dipping sauce. Pop: You can order any Pepsi product liter of pop for $3 to be delivered by Chanticlear along with your pizza. Pop is only available to purchase if you are also purchasing pizza. Cake: We order our cakes from Walmart; choices are marble, chocolate, white, rainbow blast or yellow. You may choose buttercream or whipped frosting (the whipped is a non-dairy option). It will be decorated with balloons and "Jam Hops" in a variety of colors with "Happy Birthday and your child's age and name". Standard Cake Cost: 1/4 sheet (feeds 24 with 2 inch square pieces)-$21; 1/2 sheet (feeds 48 with 2 inch square pieces)-$32. **Cakes may not look exactly as pictured. See picture below. Juice boxes: They will come in a variety of flavors. Cost: $2.50 for every 10 juice boxes; sold by the box of 10. All ages are welcome to attend your Jam Hops party. Anyone 18 months - 18 years old will count towards your number of guests that you are paying for. Children under 18 months are welcome to attend but will not count in your number of guests, but if they will be doing anything in the gym they will need a waiver filled out. All children ages 3 years and younger need to be under direct supervision of an adult. Although we encourage the parents of the guests to drop their children off and not stay at the party, adults are welcome to stay at the party, but are not allowed on the equipment. All participants are required to have an online waiver filled out and signed by their parent or guardian in order to participate in the party. The waiver can be found at the bottom right of this page. The waiver can be filled out ahead of time or upon arrival to the party. Saturday school year times are typically 4:00, 4:30, 5:00, 5:30, 6:30, 7:00, 7:30 and 8:00pm . Call for special times on holiday weekends. Saturday summer time are typically: 11:00, 11:30, 12:30, 1:00, 1:30, 2:00, and 3:00. Sunday school year times are typically 12:00, 12:30, 1:00, 1:30, 2:30, 3:00, 3:30, 4:00, 5:00, 5:30 6:00, and 6:30pm. Sunday summer times are typically 2:30, 3:00, 3:30 4:00, 5:00 and 5:30. Additional party times may be available upon request. Some of our weekends we have events going on so there may not be parties available or we may only offer certain times. *You may want to schedule your party a couple months in advance in order to get the date and time you are hoping for. 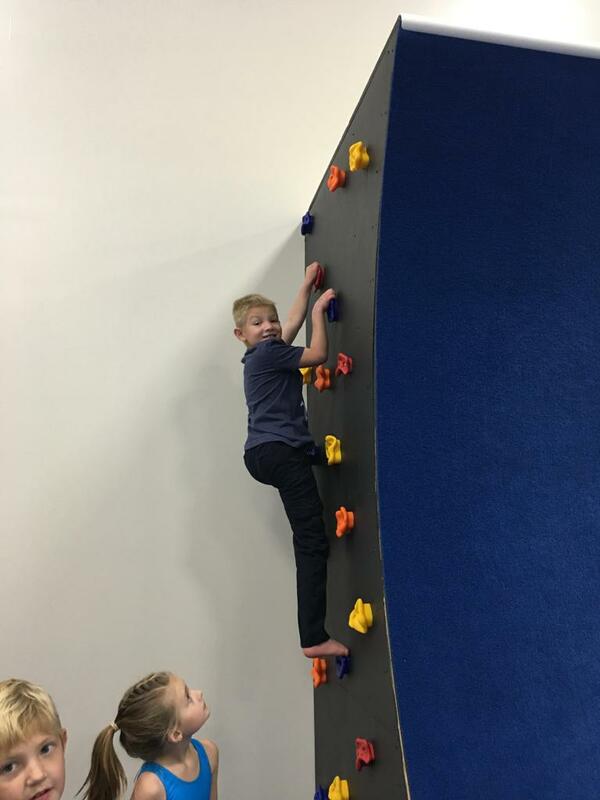 Come climb the rock wall as part of the birthday party!